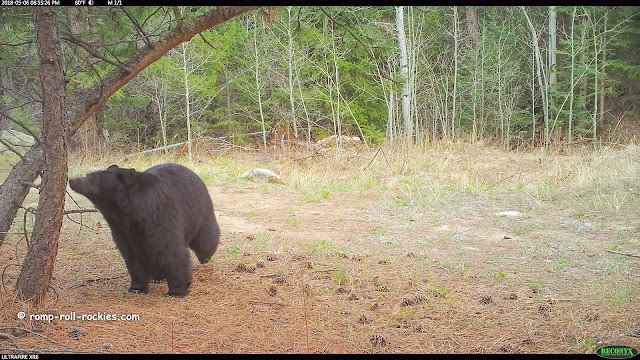 Romping and Rolling in the Rockies: Bears marking and sniffing! Our bears have started their active season more slowly than usual. 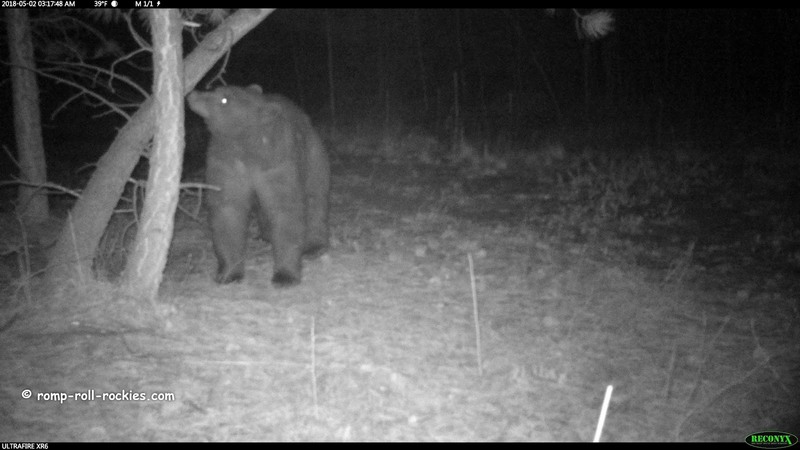 A number of our usual bears haven't shown up yet, leaving me feeling a little worried about whether they're okay. The most notable one is Milton, one of our two big dominant males. I am watching closely for all of them. In the meantime, some bears who I don't recognize have been active. 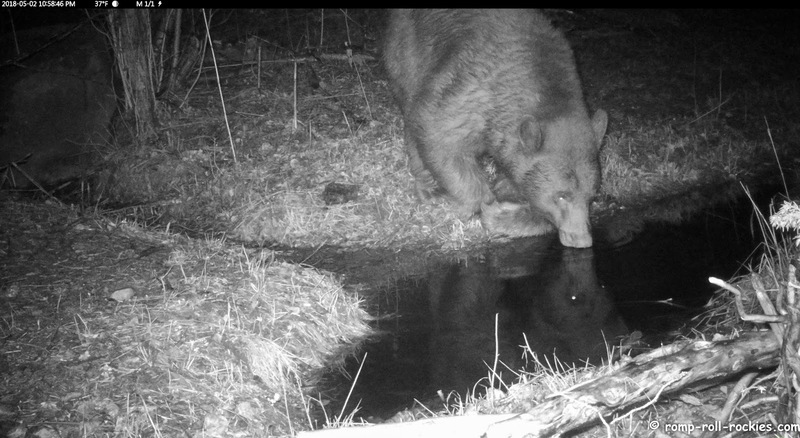 Do you see the reflection of this bear in the pool? Nearby on that same day, a male bear was busy marking trees. This is the same tree that Tiny marked a few weeks ago. This bear is not as big as Tiny. He went straight uphill to another marking site that is also a new site for a cam for me. You can see a bent over tree in the next photo. I noticed that there was fur stuck to the bark on the downward facing side of the trunk. My cam told me why! As you can see, I set the cam to be pointed too low. I expected that the bears were marking the tree by walking under it and rubbing their back on it as they walked. I was wrong. They were actually standing up on their hind limbs to mark it just like they mark other trees. I fixed the cam after I saw the footage of this first bear. 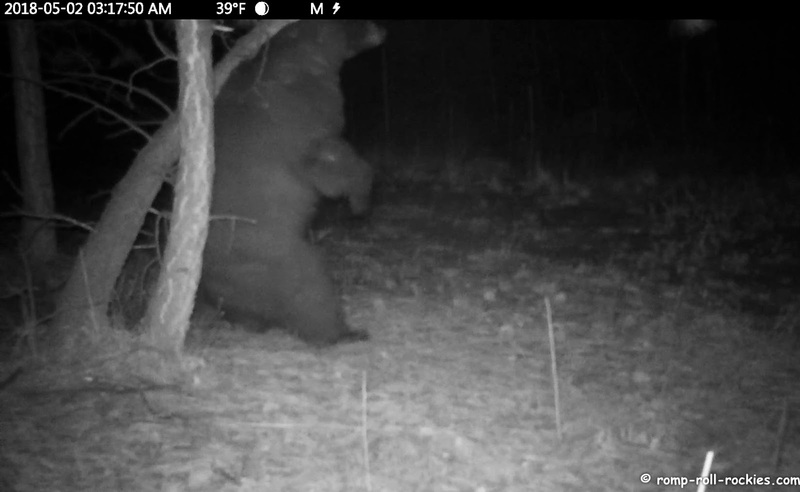 Then, the bear walked a few miles by an unknown route, marking many trees along the way. When he stood up to mark one of them that had a cam close to it, I knew for certain that he wasn't Milton. There was no white patch on his chest. 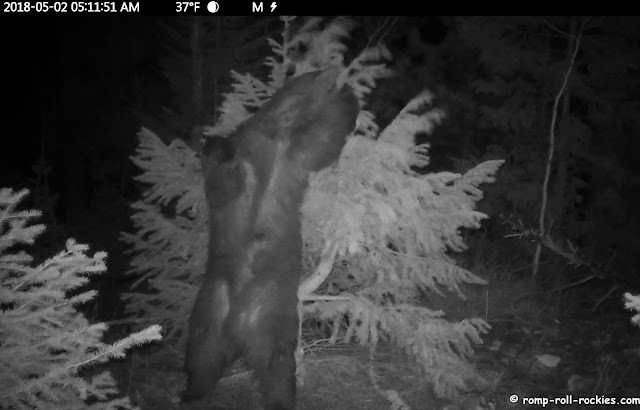 Back at the leaning tree, a smaller female bear came along to check out the tree a few days after the male marked it. She delighted me when she stood up to sniff up where the male had left his mark. Look at her round belly after a full winter without eating. She reminds me a bit of a bear who I called "Dot" who died a couple of years ago. I'll tell you her full story in a future post. I still miss Dot who brightened so many days for me with her feisty way of living. I believe that she was going to have her first cubs in the den the next winter. I have put together a short video of this bear activity. You can watch it here or at Youtube. The size always amaze me but they are gorgeous! 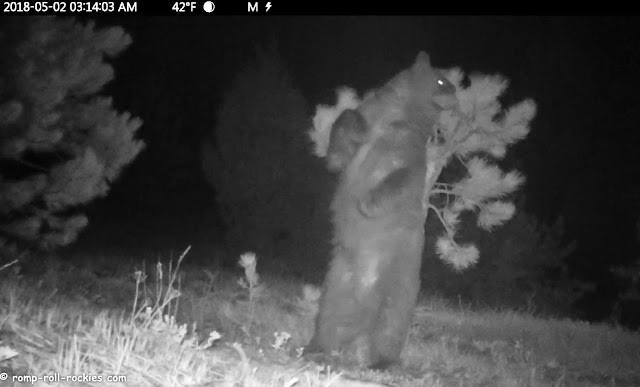 that first bear in the video sure marked that tree on every limb on every side. my favorite is the standing up bear sniffing the tree. 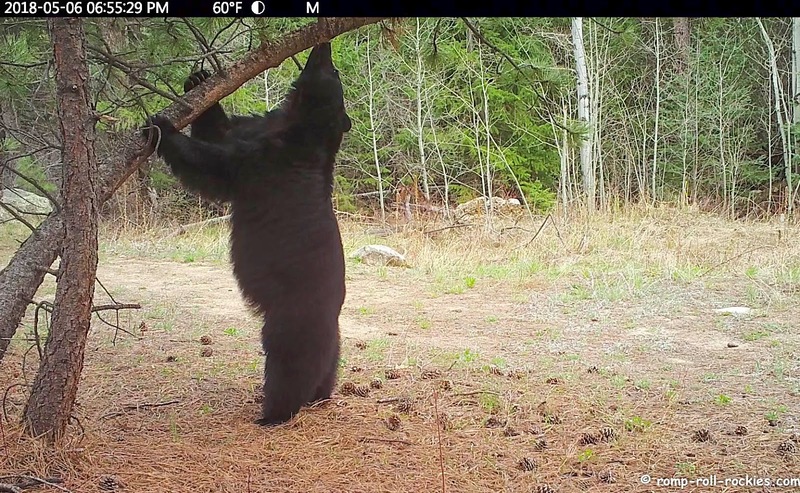 What a great post...love the last photo of the bear standing. For some reason a 5 year old girl went out into her yard in the wee hours to investigate a noise. I guess she startled the bear and it drug her off but dropped her when the mother came out screaming. Lots of stitches but she will be all right. Geeez a 5 years old sneaking of outside. They might want to get an alarm for their doors. Yes, that's a terrible situation. Alarms on the doors would be a good idea. The word "lumbering" came to my mind, then one frolicked off, that changed my words, almost quite lithe, they are all such magnificent animals, and the bendy tree, what a fascination with it, maybe bare bark, or a new one to mark out. They just don't look real. Such beautiful creatures! We always love seeing the bears. We heard the same story that Madi's Mom mentioned above and were hoping it wasn't any of the bears we have seen here. Such a sad situation. Hundreds of miles from us so not one of "ours". Your bear pictures and videos always make us smile. We love getting this glimpse of their hidden lives. Those bears are so big! And thinking about how strong they are, its amazing the trees to not break! We love seeing your amazing photos of the bears! I love their little "marking dance"! OMD, they are sooooo coooool!!! They kinda remind me of MOI, when I rub my snooter on the furniture! BOL!!! We love the bears! It was surprising that they got active a bit later cuz we had spring come early here. Oh don't be surprised about a round belly after no eating. Our mom is just like that! I'm glad you've had some bear activity, but hope your favorites show up soon too!